It’s graduation season, which means it’s time for this year’s post on the North Bennet Street School’s Student and Alumni Show. (You can read the past two years here and here). This is an event that I always look forward to. 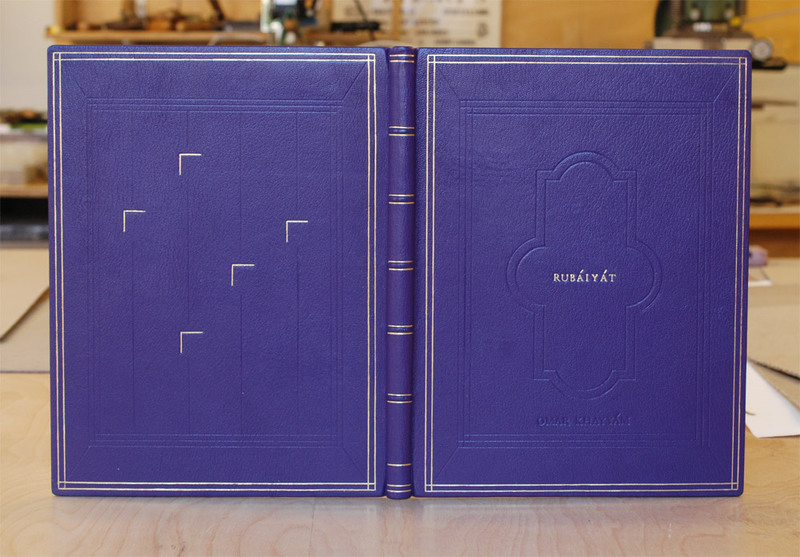 The graduating students are each given a copy of the same book (a set book) and asked to create a design fine binding. The amount of creativity and talent that goes into each binding really displays each student’s personality. The exhibit is currently on view at the North Bennet Street School in Boston, Massachusetts until May 29th. If you are around, please pay a visit to see these bindings up close. The set book for this year’s graduating class is the The Rubáiyát of Omar Khayyám. It’s a beautifully illustrated book printed in a rather large format, which is something many of the students discussed with me. After photographing each book*, I had a discussion with each binder. We talked about the inspiration behind their designs, their thoughts on the binding process and what challenges they faced. * I want to note that the photographs were taken in various spaces at the school under not ideal lighting. So you may see variation in color for some of the bindings. Kaitlin Barber‘s approach to her design stems from her admiration of 18th century tooled panel and Cambridge panel patterns. Though in her design, she reinterpreted this look in a sleek and modern way. The binding is covered in a maroon goatskin with a raised window framing two inset panels of spalted tamarind. Kaitlin’s decision to use wood was inspired from an article by Helene Jolie and during a workshop taught by Jim Croft. In the article, Helene writes about the variety of materials one might employ as an inset panel, while Jim introduced shaping possibilities during his workshop. I think Kaitlin’s use of the spalted tamarind is genius, not only is it really beautiful and is elegantly shaped, but it also acts as symbolism for the message of life and death peppered throughout the book’s text. The dark abstract shapes in the spalted wood occurs when fungus enters the tree often causing it to die. 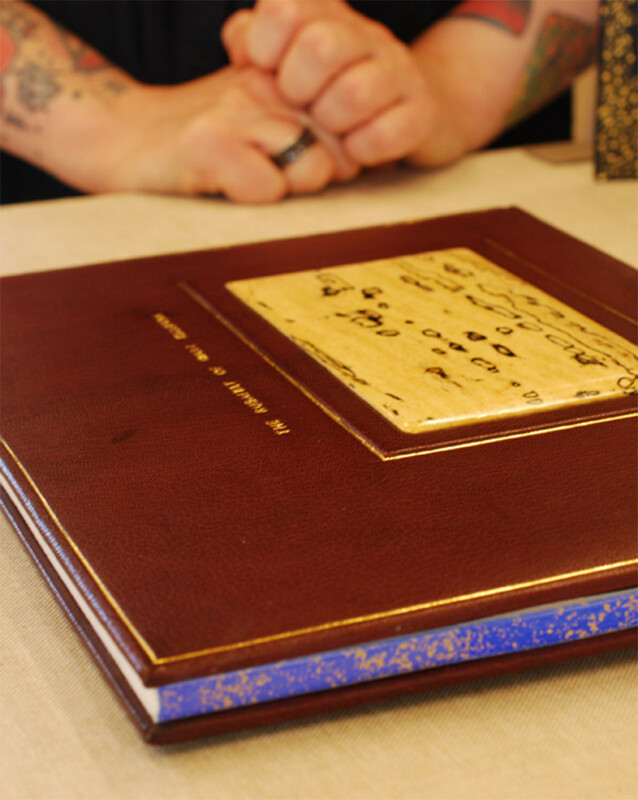 Gold tooled borders highlight the spalted tamarind as well as frame the entire the book. The title is tooled alongside the front panel. The head edge is airbrush with a brilliant blue acrylic, then sprinkled using gold leaf. The French double core headbands are sewn with silk threads. Kaitlin used a marble paper as her paste down and flyleaves. One of the main challenges Kaitlin faced during the binding process was working with such a large format, specifically when it came to paring the leather. Due to its size the leather included many areas of the skin such as the arm pits and backbone. These parts of the skin will react differently when being pared; the arm pits are stretchy while the backbone is a bit tougher. In the end it was a really great learning experience for Kaitlin. 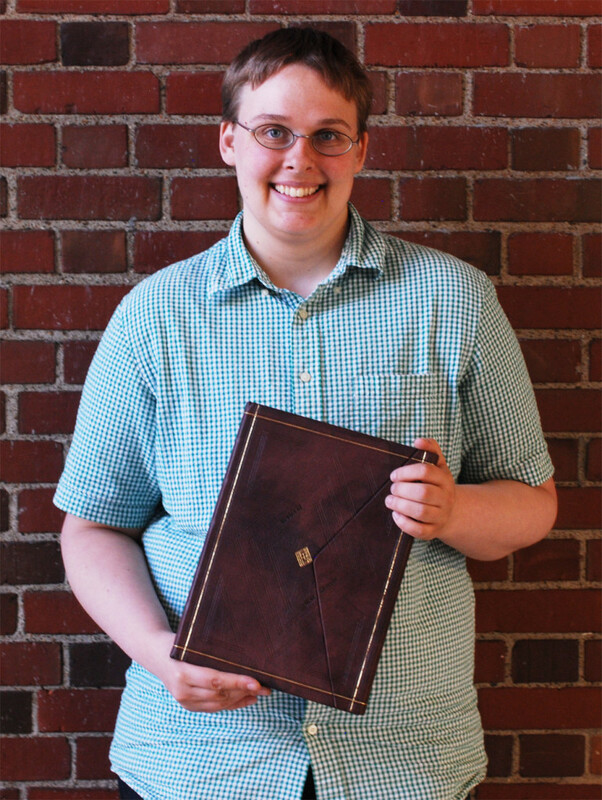 After graduation Kaitlin will continue in her internship at the Boston Public Library’s Rare Book Room, which began in January and will run through the summer. Lauren Calcote’s interpretation of The Rubáiyát is brilliant. The text is notably one of the most famous pieces of Persian literature, which was translated into English for the first time by poet Edward Fitzgerald in 1859. 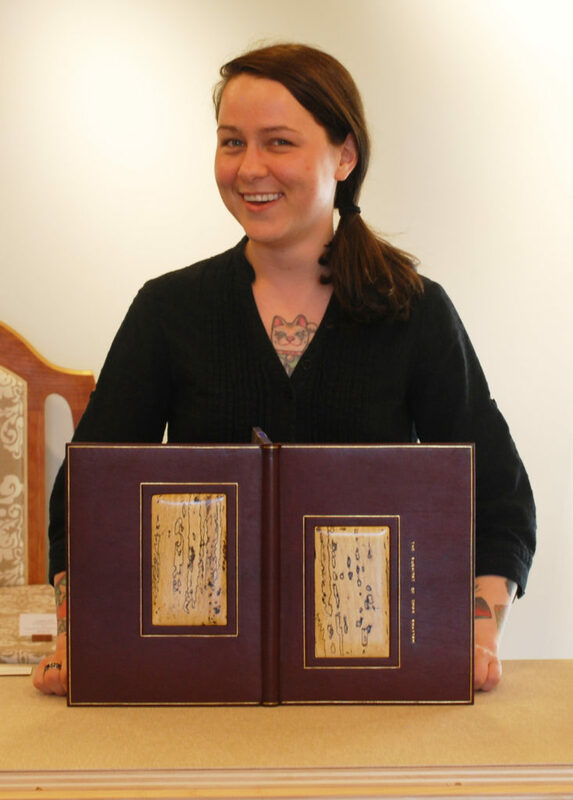 Considering this relationship between its origins and the initial translation, Lauren played with the binding structure by combining a fine binding and Islamic binding. The book is covered in fair goat that was hand-dyed by Lauren in a beautiful mottled aubergine purple. The fore edge flap speaks to the Islamic binding structure, but sits on top instead of underneath the front cover. The flap lays inside a well securely fastened with a hidden magnet. Decoration on the front and back covers include gold and blind tooled lines laid out in a geometric design inspired by Persian patterns. The title is carbon-tooled on the front cover. The poet’s last name appears on the front of the flap and in the well. Other details include the custom-made endpapers reminiscent of those found in Islamic bindings. The paste down and fly leaf are hand painted with sprinkles of gold leaf. The edges of the text block are decorated in the same fashion. The headbands follow the Islamic chevron pattern around a round core. Planning this hybrid structure was an enjoyable challenge for Lauren, particularly finding the right fit for the flap by making sure it didn’t sit too proud. Another issue came during covering, Lauren initially wanted to cover the book in one full piece (from flap to front fore edge). Yet to achieve the desired height for the flap, Lauren choose to cover the base of the well with a separate thinner piece of leather. This seam is absolutely flawless and I would have never known if Lauren hadn’t explained the process to me. So bravo, Lauren. The last major design hurdle was where to tool and how to tool (mainly on the flap and well). She flip-flopped between tooling the well and leaving it bare. Lauren and I discussed how tooling the well was definitely the better decision. That the design works whether the flap is open or closed. 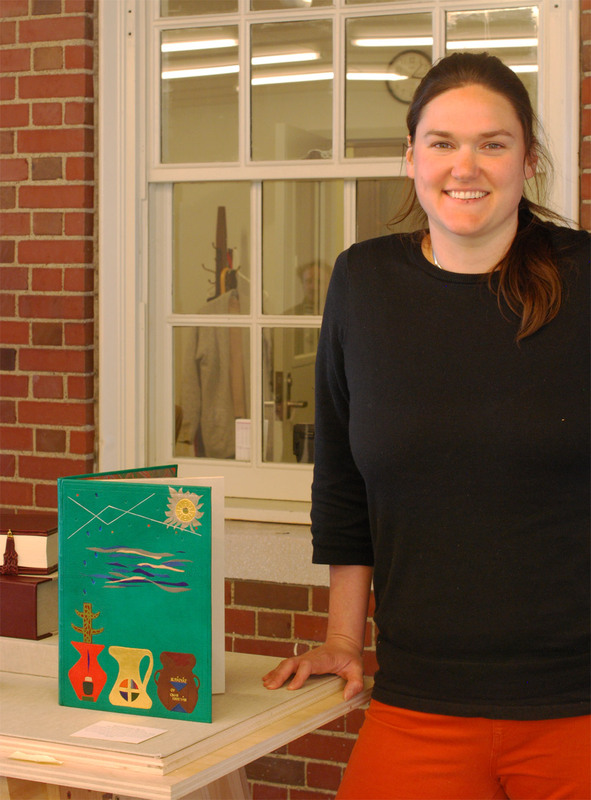 After graduation, Lauren will be spending the next six months at the Boston Athenaeum as the 2015 Lisa von Clemm fellow. On December 1, 1948 an unidentified man was found dead on Somerton Beach in Australia. This mystery was dubbed The Taman Shud Case, a phrase meaning ended or finished in Persian. Found in a hidden pocket of the man’s trousers was a printed scrap of paper, which turned out to be removed from the final page of The Rubáiyát of Omar Khayyám. This eerie tale is where Joshua Crotty drew his design inspiration. This simplistic design conveys a sense of heat, like being stranded on an Australian beach or Persian desert. The binding is covered in a beautiful sandy tan goatskin. 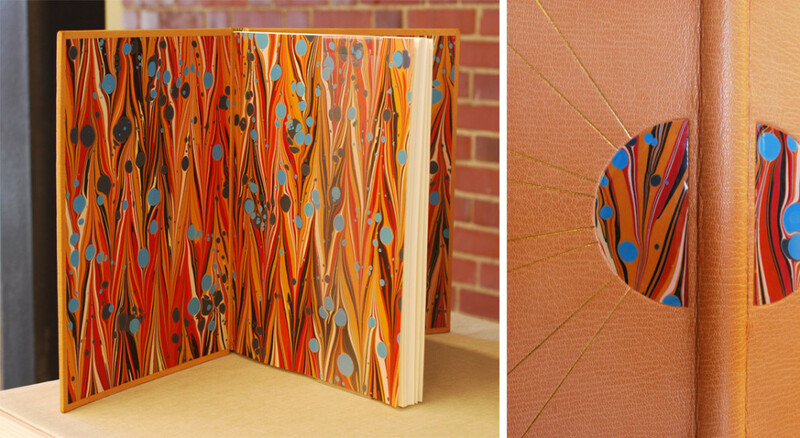 The central inlaid design is created using marbled paper laminated to mylar representing a hot, golden sun. Gold tooled lines radiate from the half-circle inlays creating the rays of the sun. Joshua creates a fluid design by using the same marbled paper as the paste down and flyleaf. The head edge is gilded in the rough with gold leaf. I really love simple designs that are captivating and strong. Joshua’s inspiration is intriguing and really shines through; his simple design is ambiguous and holds a little bit of mystery. Joshua’s talents as a binder has already landed him in an impressive position as a hand bookbinder for the U.S. Government Publishing Office. His job is to serve the needs of Congress by creating finely crafted bindings to suit their needs. Joshua relocated to D.C. during his last semester at North Bennet Street School and this became one his major challenges during the binding process. He left behind a nice large bench to working on a kitchen table while also dealing with D.C.’s humidity; experiencing extended drying time made things a bit tough. These challenges didn’t hinder his ability to create crisp, clean gold tooled lines. Beautiful binding Joshua! 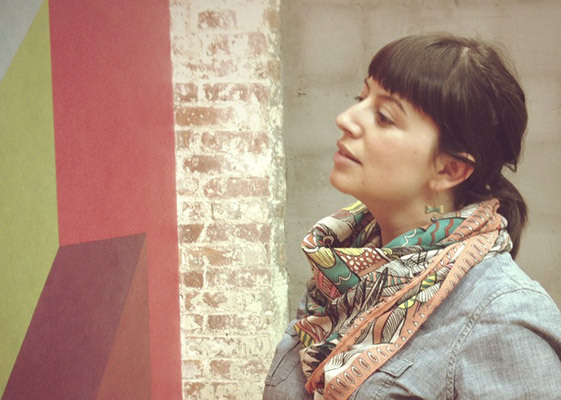 As Megan Gibes describes the inspiration behind her design she explains that the poems are broken up into four lines with the crescendo occurring in the third line. The binding is covered in a medium gray goatskin with stripes of onlays in tan goatskin representing these four lines. The inner onlays are tooled, while the onlays near the head and tail are back-pared. This clean, minimalistic design is exactly what Megan wanted to achieve from the beginning as a way to juxtapose the grandiose bindings generally associated with The Rubáiyát. The title is carbon-tooled down the length of the spine with Rubáiyát sandwiched between Omar and Khayyám (click on the image above for a better view). The head edge is shaded with graphite and gauffered with a thin line palette. The headbands are sewn in silk over a single parchment core. Megan sourced the perfect marbled paper to line the boards and fly leaf. 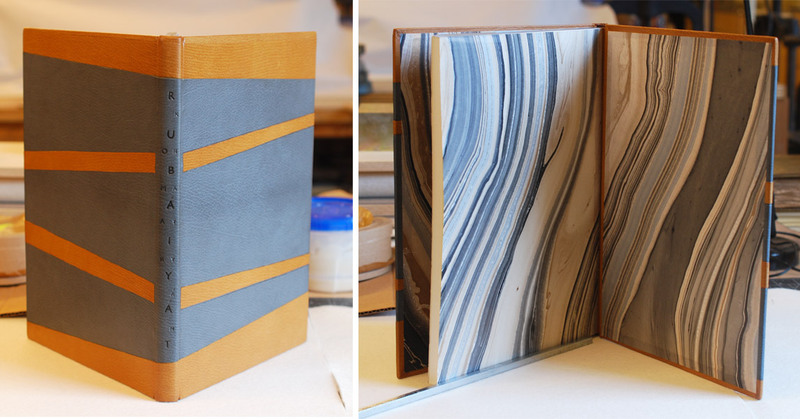 This large-scale marbled design works so well with the format of this binding, while also tying in the color scheme Megan chose for the cover. Megan and I chatted about the challenges of creating a fine binding, how overwhelming the process can seem. Megan’s strategy was to isolate each step and to only move forward when she felt completely satisfied. One challenge that arose came during the paring process and some miscalculations. By edge paring the leather a bit too short, this left with a visual drop in the leather after covering. Megan added a patched onlay, which fixed the situation and actually looks quite seamless. After graduation, Megan will be moving across the country to Santa Barbara, California. She’s been hired as the Head Binder for Neve Albums where she’ll be producing unique albums, guests books and custom boxes. Neve Albums brought on Megan to help establish an in-house bindery to help expand their business. Best of luck Megan, sounds like a great gig! Omar Khayyám lived during the 11th and 12th century making a living as a mathematician, astronomer, philosopher and poet. His poetry includes several themes such as life, death and love. For her design, Shannon Kerner reinterpreted these themes using symbols found on Southwestern Native American rock wall art. The shapes of each vase is derived from typical Persian styles. The first vase represents the spirit of the ancestor with the tree of good life growing from the ancestor and falling rain. The symbol on the center vase represents the virgin. The final vase includes the title tooled in gold along with the symbol for the water clan, which is represented by two inverted triangles inside of a rectangle. This final symbol, just like the vases, are symbols for water and life, which circles back around to the first vase. As I mentioned before, Omar Khayyám worked as an astronomer and was tasked with reforming the calendar in order to minimize seasonal errors; this was something Shannon wanted to reflect in her design. The top half of the design includes a sun created through surfacing gilding palladium and gold. The rain passes through a dreamy cloudscape and blind tooled stars representing the night sky. 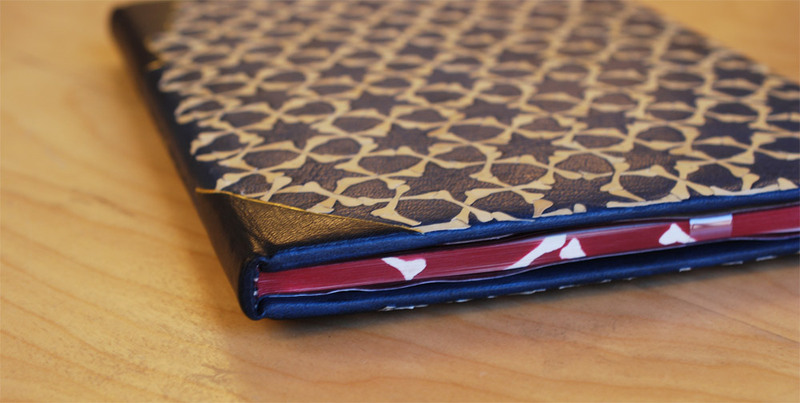 Shannon’s binding is bound in a bright teal goatskin with several layered onlays. Other decorative elements include surface gilding, foil tooling and blind tooling. The head edge was rough edge gilt. The paste down and flyleaf are covered with a hand marbled paper made by Shannon (detail shown above). Shannon employed a variety of techniques in her binding. One particular element that I found intriguing was her use of three different colored foils within the teardrop tool, which offers an elegant subtly to the design. As we chatted about her process, she pointed out the challenges presented when creating the sun. The center is surface gilt with gold leaf, while the outer rays are surface gilt with palladium leaf. Butting up these two leaves meant that the Frisket (a masking film) would be placed on the gold leaf. This film pulled up some of the leaf, but Shannon successfully mended any losses creating a striking image for her overall design. Come graduation, Shannon is looking forward to her next step and where it might take her. She is anxiously awaiting to hear the results of prior interviews. 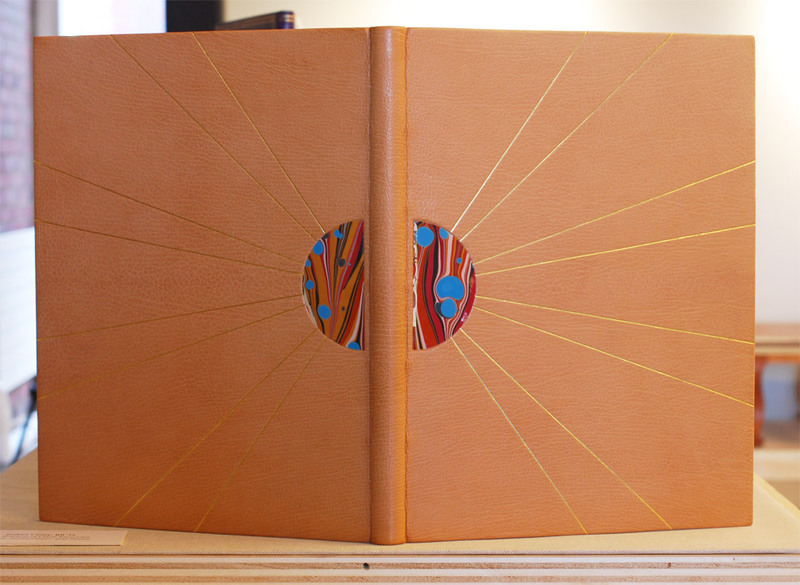 Earlier this year, Boston College exhibited the work of Mark Esser, who was the first instructor at North Bennet Street School and is apart of a lineage of master bookbinders. His work greatly inspired Lindsay Nakashima as she approached her design for The Rubáiyát. Lindsay also planned to utilize both gouges and palettes as a challenge to work with the tools she has been introduced to over the course of the second school year. The binding is covered in a vibrant purple chieftain goatskin from Hewit (best represented in the image below). 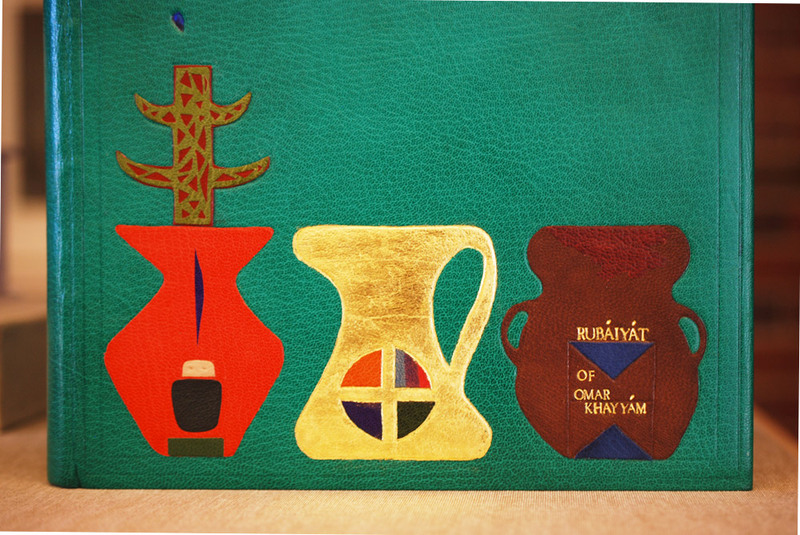 The other students chose to use Harmatan goatskin for their bindings, but Lindsay was attracted to not only the lush color, but the heavy grain. This was also a great opportunity to play around with a different type of leather, to get a sense of how it can be manipulated and tooled. The head edge is rough edge gilt with French double core headbands wrapped in silk. Zerkall paper was used for the paste down and fly leaf. Lindsay’s binding has quite a classic, clean look. She emphasizes the back corner, which offers a more elegant (or dare I say more feminine) feel for the size of the binding. Lindsay’s most challenging aspect of this process was the gold tooling, which most binders can attest to its difficulties. Yet tooling on an unfamiliar leather can heighten the challenge. Lindsay noted that the chieftain goat felt less spongy and less susceptible to making an impression. But Lindsay plowed through the process and created beautifully tooled lines. 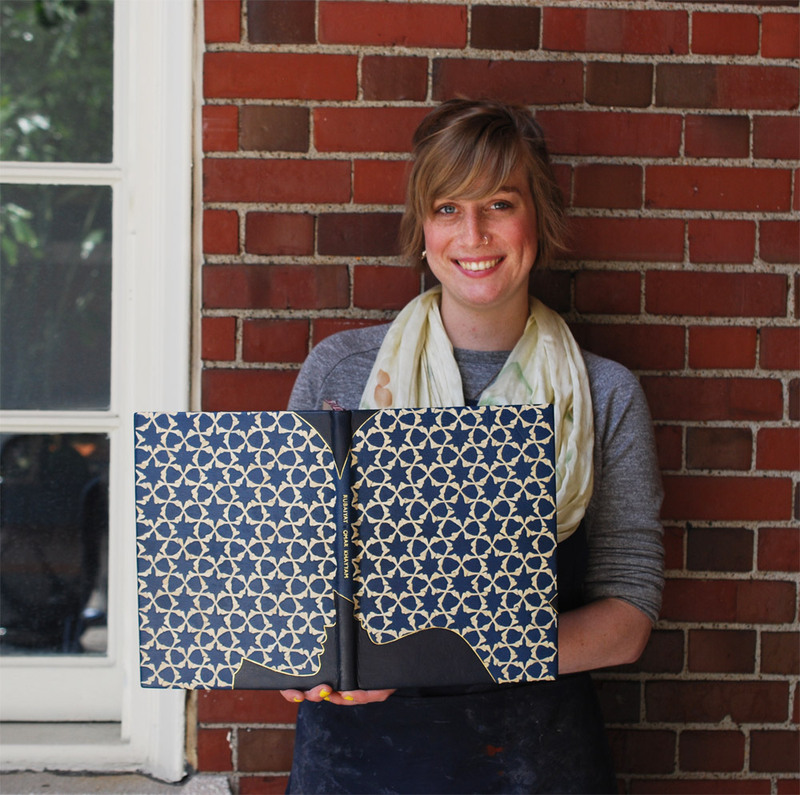 After graduation, Lindsay will be moving back home to Austin, Texas where she’ll be setting up a bindery space. Her intentions will be to open this space for teaching simple workshops while also bringing in restoration commissions under the name Nakashima Books. Best of luck, Lindsay. Death is a reoccurring theme in Khayyám’s poetry and one that inspired many of the students in this exhibit. Jacqueline combined this theme with a love story threaded throughout the text. These themes are represented by the profile of a couple embracing and bones. 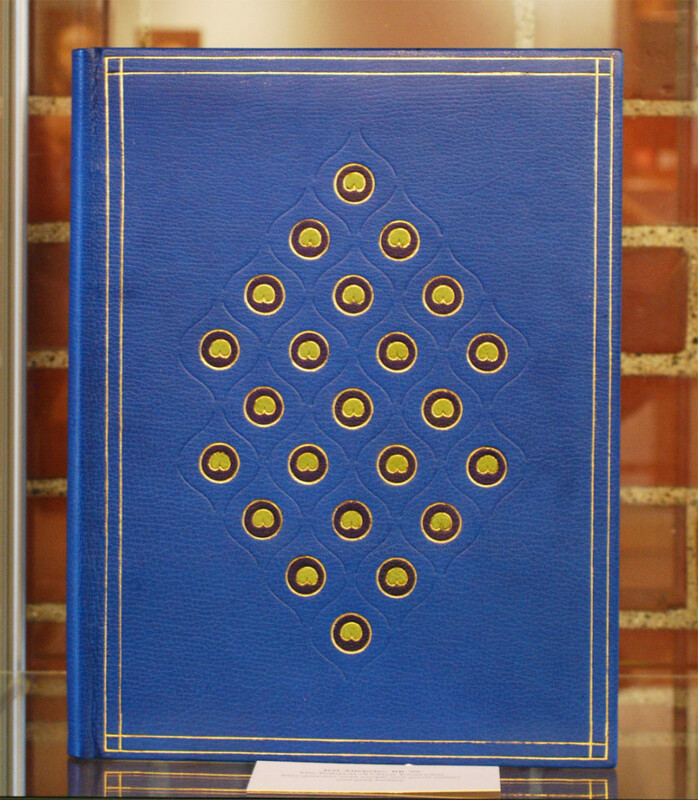 Jacqueline’s book is bound in a blue goatskin with over 400 parchment back-pared onlays, these parchment bones create a classic Arabic geometric design. Jacqueline’s work with the parchment is quite impressive and I asked about her approach to using this unconventional material as a back-pared onlay. In her initial tests she overlapped two bones, but this created too much bulk and tore during the paring process. She also backed the parchment with tissue using gelatin. Jacqueline used this tissue as a barrier between the PVA and parchment, plus the tissue increases the opaqueness of the onalys. A little setback occurred during covering when the gelatin lifted from the moisture in the paste, but Jacqueline was able to reattach any raised onlays. The shape of the couple is accented by dark blue gold tooled onlays. The title is gold tooled down the length of the spine. The head edge is airbrushed with a deep red, bone shapes are masked out revealing the white of pages underneath. The boards are lined with matching edge-to-edge doublures and cork paper fly leaves. After graduation, Jacqueline will begin the first of three internships. Starting with a month-long internship at the Francis Loeb Library which is affiliated with the Harvard Design School. I’m looking forward to seeing Jacqueline later in the summer at the University of Virginia during her second internship while I’ll be attending Rare Book School. The success of the student’s bindings are due to the instruction from Jeff Altepeter and I thought it best to end this post with his colorful binding. Jeff drew inspiration from The Great Omar. In 1909, Sangorski & Sutcliffe was commissioned to create a sumptuous binding for The Rubáiyát of Omar Khayyám. Given carte blanche and a limitless budget, the remarkable firm created the most ornate binding with thousands of jewels, complex gold tooled designs and leather onlays. Upon completion in 1911, the binding was shipped a year later to New York by way of the Titanic. Jeff pulled a single element from “The Great Omar”: the peacock (also a common motif on Sangorski & Sutcliffe bindings). His abstract interpretation of the peacock feather is laid out in a lozenge-like pattern. Instead of the traditional straight lines he employed the ogee finishing tool, which is a long, thin “S” shape. This tool created a very elegant, feather-like border around the “eye”. This center shape is made up of two gold tooled onlays. The inner one is tooled from a custom made finishing tool. Jeff is a master at crafting his own finishing tools; he made a few variations of the tool before settling on an open design rather than a closed one. The book is bound in a brilliant blue goatskin with an airbrushed head edge and hand sewn French double core headbands in silk. Marbled paper lines the inside of the covers and flyleaves. I asked the students about their challenges during the binding process and I posed the same question to Jeff. In an ideal situation, a binder wants a comfortable amount of time between each step. Yet for an instructor these steps might get rushed in order to show the process to students in a timely fashion. And there are less chances to tweak your design within these time constraints. But I think Jeff was able to capture the spirit of The Great Omar. So there you have it. 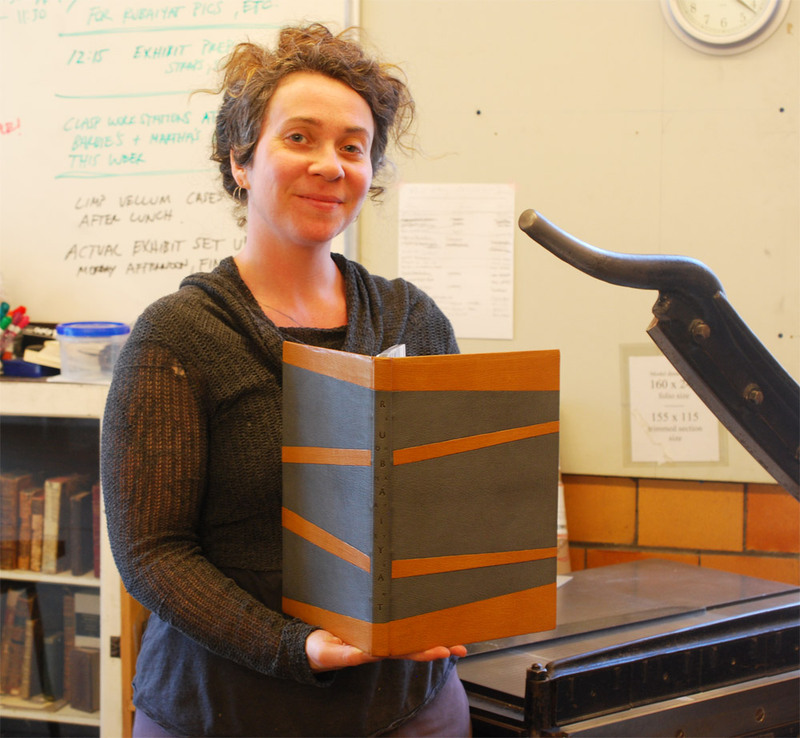 My best to the graduating class of 2015 as you enter the world of bookbinding and conservation! Seeing the beautiful bindings is a treat; hearing the stories behind them is like getting a bonus book with each order! Thank you for sharing the inspiration behind the beauty. It adds even more to the story itself.